Argeș County (Romanian pronunciation: [ˈard͡ʒeʃ] ( listen)) is a county (județ) of Romania, in Muntenia, with the capital city at Pitești. 1The development regions of Romania have no administrative role and were formed in order to manage funds from the European Union. On 20 October 2011, it had a population of 612,431 and the population density was 89/km². This county has a total area of 6,862 km². The landforms can be split into 3 distinctive parts. In the north side there are the mountains, from the Southern Carpathians group – the Făgăraș Mountains with Moldoveanu Peak (2,544 m), Negoiu Peak (2,535 m) and Vânătoarea lui Buteanu peak (2,508 m) towering the region, and in the North-East part the Leaotă Mountains. Between them there is a pass towards Brașov, the Rucăr-Bran Passage. The heights decrease, and in the center there are the sub-carpathian hills, with heights around 800 m, crossed with very deep valleys. 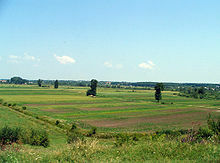 In the south there is the northern part of the Romanian Plain. The Argeş County Prefecture building from the interwar period, now the Argeș County museum. The county was located in the central-southern part of the Greater Romania, in the western part of the historic Muntenia region. Its territory comprised a large part of the current county, and a piece of the western part of the present Vâlcea County. It was bordered on the west by the counties of Olt and Vâlcea, to the north by the counties Făgăraș and Sibiu, to the east by the counties Muscel and Dâmbovița, and to the south by the counties Teleorman and Vlașca. Map of Argeș County as constituted in 1938. According to the 1930 census data, the county population was 257,378 inhabitants, out of which 97.6% were ethnic Romanians. From the religious point of view, the population was 99.1% Eastern Orthodox, 0.3% Roman Catholic, 0.3% Jewish, as well as other minorities. In 1930, the county's urban population was 26,341 inhabitants, comprising 90.4% Romanians, 2.2% Jews, 2.0% Hungarians, 1.7% Romanies, 1.1% Germans, as well as other minorities. From the religious point of view, the urban population was composed of 93.0% Eastern Orthodox, 2.4% Roman Catholic, 2.4% Jewish, 0.7% Reformed, 0.7% Lutheran, as well as other minorities. Wikimedia Commons has media related to Argeș County. ^ National Institute of Statistics, "Populaţia la recensămintele din anii 1948, 1956, 1966, 1977, 1992, 2002"